Fresh strawberry taste mixed with the decadent creaminess of cheesecake. Yeah, you're drooling, don't deny it. This strawberry cheesecake might just turn you off of regular cheesecake forever. 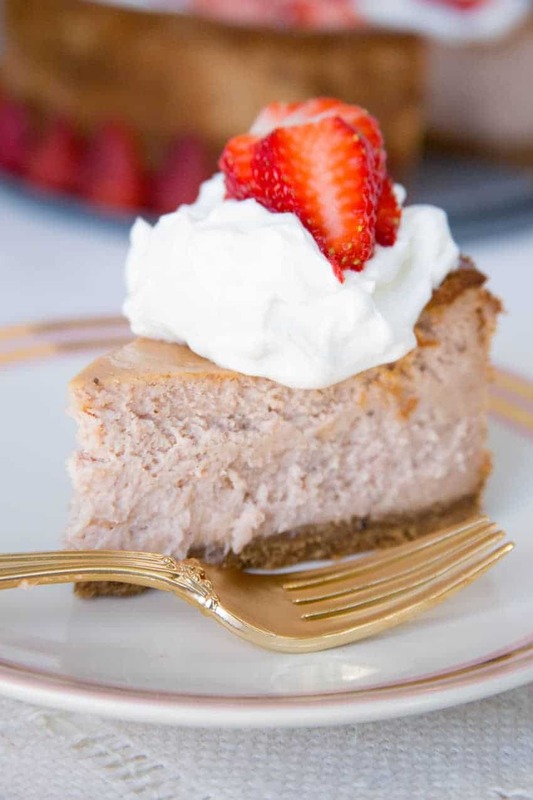 Once you try this Real Strawberry Cheesecake recipe that’s packed full of fresh strawberry flavor, you’ll never go back to the gloppy-red-topping version. I’m often disappointed with what some folks call strawberry cheesecake: a slice of New York style with a berry or two and some fluorescent red sauce on top. That’s just false advertising, as far as I’m concerned. This recipe is fresh strawberry through and through, and I know you’ll love every bite. The fruit gives this cheesecake a lighter texture and a gorgeous pink center, with plenty of creaminess to satisfy your inner cheesecake lover. 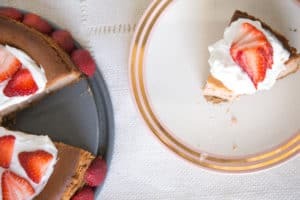 I use gluten-free graham crackers in the crust, but I’ve tried it with a sugar cookie crust and that was delish too. If (when!) 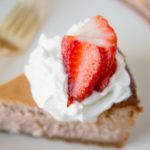 you try making Real Strawberry Cheesecake, pop a photo on Instagram and tag me (@gfreefoodie) or share with me on Facebook – I’d LOVE to see your berry confections. Add the crackers to the bowl of a food processor, and pulse until crumbly. While pulsing, slowly add the melted butter, stopping occasionally to scrape down the sides. Once thoroughly mixed, press the mixture into a 9-inch springform pan with 3-inch sides. Bake the crust until golden brown, about 10 minutes. Remove from the oven and let cool completely while preparing the filling. Fill an 8×8 pan 2/3 full of water, and place it on the bottom rack of the oven. Melt the butter in a saucepan over medium heat. Add the strawberries, ¼ cup sugar, salt and lemon juice and cook for 10-12 minutes while stirring frequently until berries have broken down and liquid has reduced to a thick syrup. Remove from heat and stir in 2 teaspoons vanilla extract and 1 tablespoon tapioca starch. In a large mixing bowl, add the cream cheese and sugar and beat with an electric mixer until light and fluffy, about 2 to 3 minutes. Add the strawberries and beat until incorporated. Beat in the eggs, 1 at a time, then add the tapioca starch and beat until incorporated. Pour the filling onto the crust and smooth the top. Bake until the center of the cheesecake moves slightly when the pan is gently shaken, about 1 hour and 20 minutes. Remove the cake from the oven let it cool on a wire rack. Turn the oven off and remove the pan of water carefully. Once cooled, use a paring knife to loosen the sides of the cheesecake from the pan. Chill the cheesecake for at least 4 hours. Serve with whipped cream and fresh strawberries. This entry was posted in Baked Goods, Desserts, Recipes, Summer Treats and tagged baking, dessert, G-Free Foodie, gluten free baking, gluten free holiday, strawberry. Bookmark the permalink.